The General Council of the Assemblies of God began publishing in 1940 a quarterly newsletter mailed to all ministers credentialed with the Assemblies of God USA. The purpose of the quarterly newsletter was to promote a closer bond of fellowship and to communicate information that could not be printed in the Pentecostal Evangel. The newsletter included the Fellowship's positions on important issues, names added to and removed from the ministerial roster, and other news. In some years either three or five issues of the newsletter, instead of four, were published. 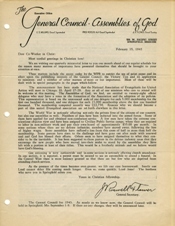 The Assemblies of God national office has also mailed occasional letters to all ministers, a practice which began as early as 1920 and which still continues. Selected occasional letters from the national office to all ministers are included in this collection.